It is so important to not only model green living for our kids, but to also include them by offering them ways that they can participate in living a greener lifestyle. When I found this recycled Rocket through my OpenSky Community I just fell in love with it. When I did a bit more digging, and discovered that it is crafted and created by a really fun duo who have a sincere passion for their entire line of beautiful, functional and closed loop designs, I knew it was something I wanted to share. I think this is really a fun way to spread the green message to our little ones. I remember how much fun I had as a kid when my brother and I would get our hands on a humungo box. We could go anywhere with the power of our imagination. 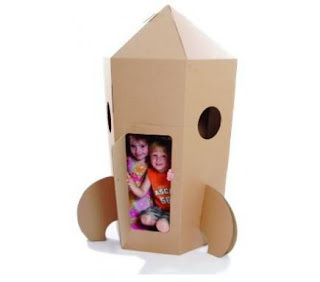 Power your child's imagination with one of my favorite green picks for kids, with this 100% Recycled Cardboard Rocket Ship. How cool is that? If you're like me and think this is cool enough to get some more information, shoot over to the Environmental Booty OpenSky Shop to get more info or pick one up for the little greenie in your life. The Paper pod Rocket is sound like unbelievable resource to give confidence role-play. We can easily decorate it both inside and out before zooming off to distant planets to enjoy their own space adventure. Nicole, I will check it out. Thanks for the info! Packaging Supplies, I think this is THE BEST imaginative play toy for young kids. Even my 13 year old thought it was cool. Thanks for the idea Shane! Hi Danica, it really is a great way for kids to play and gain a little understanding about recycling. Hope all is well with you. Hi Prav, I am glad you stopped by. Yes I am always trying to write about things that are good and healthy. Kind of the point around here. Hope you find your way back. Sharon, I still remember how much fun it was when we would get a new appliance that came with a huge box. This is a bit sturdier of course and will give a lot more hours of imaginative play. Thanks for stopping by. Thanks Donna. I will check out your site!